We have Floodlights for all the situations! Catalog Number: 5050 UL Listed: Yes Light Fixtures: 1 Height A (in. ): 10 Wattage: 500 Switch: Yes .. Catalog Number: 5130 UL Listed: Yes Light Fixtures: 1 Height A (in. ): 13 Wattage: 500 Switch: No .. Catalog Number: 5165i UL Listed: Yes Light Fixtures: 1 Wattage: 150 Switch: Yes .. Features: Weatherproof and U.L. listed for use in wet locations. Sturdy double tripod base One rough service quartz halogen bulb included with each fixture Convenient cord wrap Specifications: Height 6' Watt 500 Mast 3 Stage Switch Yes .. Catalog Number: 5710 UL Listed: Yes Light Fixtures: 2 Height A (ft.): 7 Wattage: 1000 .. The Construction Electrical Products 5750 500W Tripod Lighting System includes a 500W quartz halogen bulb. 500W domestic quartz fixture. Heavy Duty industrial grade fixture. 2-stage mast. 7 foot extendable base. 8 gauge wire fixture guard. Weatherproof spec grade on/off switch. .. Catalog Number: 5810 UL Listed: Yes Light Fixtures: 2 Height A (ft.): 8' Wattage: 1000 Switch: Yes .. Heavy Duty Industrial Grade Fixture. All Steel construction - No plastic parts. 500-watt halogen light heads. Made in the USA. 8 Gauge Wire Fixture Guard. Sturdy 10 Gauge Steel Tribase. 16/3 SJTW power supply cord. Removable head assembly on 7' and larger stands. Anti-tip-over Cord Retainer. 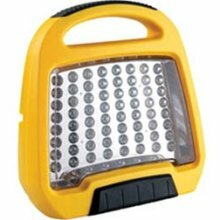 UL listed for portable work lights approved for use i.. FEATURES: Self Rights ABS Plastic Fits 2 ft and 4 ft. Defender Uplights Fill with water or sand for stability Easy to use Base Assmebly used for the 2 foot Uplight and the 4 foot uplight. Self-rights up to 60 degrees. .. FEATURES: Collapsible locking tripod base IP44 design for dust and water resistance 15-ft. power cord CSA certified Adjustable nylon carrying strap Lighting Range 10-15 Feet The Defender® Eco Uplight is the ultimate tripod task light for durability, portability and versatility. Available in a 2 foot or 4 foot v.. FEATURES: Collapsible locking tripod base IP44 design for dust and water resistance 15-ft. power cord CSA certified Adjustable nylon carrying strap Lighting Range 5-10 Feet The Defender® Eco Uplight is the ultimate tripod task light for durability, portability and versatility. Available in a 2 foot or 4 foot ve.. Features: Weatherproof and U.L. listed for use in wet locations. Sturdy double tripod base One rough service quartz halogen bulb included with each fixture Convenient cord wrap Specifications: Height 1' Watt 500 Mast N/A Switch No ..
5' 18/3 Power Cord, Plug Nema 5-15PExtendable Tri-Pod StandFoam Insulated Handles(x2) 500 Watt Bulbs IncludedcULus Listed..
3' 18/3 Power Cord, Plug Nema 5-15PS-Style BaseFoam Insulated Handles500 Watt Bulb IncludedUL listed..
High Power COB LED Provides 7000 Lumens of Light Output with Very Low Heat.3' 18/3 SJTW Power Cord, Nema 5-15PHeavy Duty 100% Die Cast Aluminum Housing with On/Off switchRatcheting Quick Head Adjustment for Light Direction with Insulated Foam Handle50,000 Hour Life SpancULus Listed..
High Power COB LED Provides 1500 Lumens of Light Output with Very Low Heat.3' 18/3 SJTW Power Cord, Nema 5-15PHeavy Duty 100% Die Cast Aluminum Housing with On/Off switchRatcheting Quick Head Adjustment for Light Direction with Insulated Foam Handle50,000 Hour Life SpancULus Listed..
High Power COB LED Provides 880 Lumens of Light Output with Very Low Heat.3' 18/3 SJTW Power Cord, Nema 5-15PHeavy Duty 100% Die Cast Aluminum Housing with On/Off switchHead Adjustment for Light Direction with Insulated Foam Handle50,000 Hour Life SpancULus Listed..
High Power COB LED Provides 800 Lumens of Light Output with Very Low Heat.Recharageble & Replaceable 2pc Lithium BatteryDetactable Charging CordHeavy Duty 100% Die Cast Aluminum Housing with On/Off switchRatcheting Quick Head Adjustment for Light Direction with Insulated Foam Handle50,000 Hour Life SpancULus Listed..
5' 18/3 Power Cord, Plug Nema 5-15PTri-Pod Features 2 in 1 Removable H-BaseHeavy Duty Face FrameFoam Insulated Handles500 Watt Bulb IncludedcULus Listed..